Mauricio's Stone Craft is a full service installer of countertops made from Granite, Marble, Quartz, Quartzite, Ceasarstone, and silestone with various edge finishes. Mauricio also installs sinks including the required plumbing so your sink is in full working order when he completes the installation. 8am - 3pm on Saturday. MAURICIO'S STONECRAFT specializes in the fabrication and installation of beautiful stone products, including granite, marble, quarts, ceasarstone and backsplash for commercial and residential applications throughout the DFW metroplex. We also have a variety of installed sinks for you to see and can help you understand the difference between an under mounted sink and a top mounted sink. We offer sinks made of ceramic, stainless steel, and composite. And don't forget, your sink will not only be installed, we will also make sure all the plumbing work is completed as well. 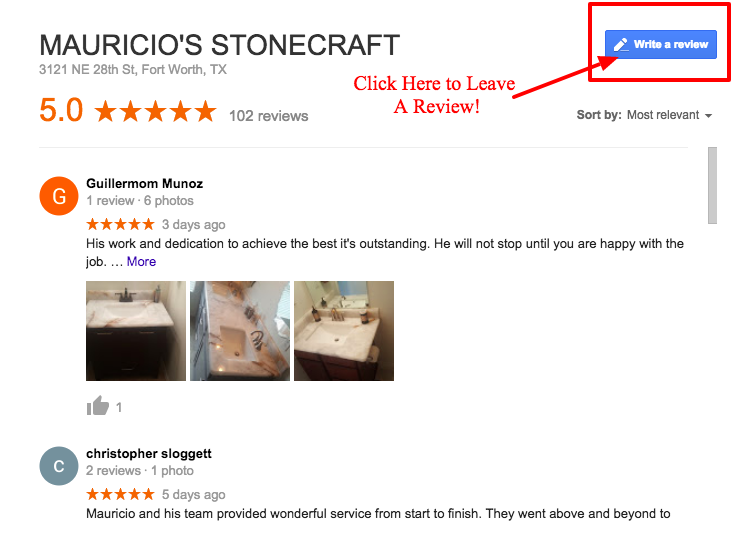 Mauricio's Stone Craft offers residential and commercial services. MAURICIO'S STONECRAFT es un servicio completo,instalador de Tapas de granito, mármol, cuarzo, cuarcita, Ceasarstone, y silestone con el borde de varios acabados. Mauricio también instala fregaderos incluyendo la plomería requerida para que el fregadero este en funcionamiento cuando se complete la instalación. También tenemos una gran variedad de (sinks) o fregaderos instalados para que veas y puedas entender la diferencia entre un bajo fregadero montado y un fregadero montado superior. Ofrecemos fregaderos de cerámica, acero inoxidable y compuesto. Y no sólo se instalará el fregadero, también vamos a hacer que todo el trabajo de plomería sea completo. Piedra Artesanal de Mauricio ofrece servicios Residenciale y Comerciales. Please go to our Facebook page and give us your feedback! Mauricio did an amazing job with my kitchen remodel! I love the new marble countertops in my kitchen. Mauricio's StoneCraft did a wonderful job. Thank you for my beautiful kitchen! I love entertaining friends and cooking for my family now. The kitchen is my favorite room in the house! I wasn't sure what would work best in my kitchen countertops, backsplash, and sink. The choices can be overwhelming but when I visited the showroom I got to see the samples and it helped me make the right choices. Abel and his crew did a fantastic job. It was turnkey. The best experience we have had with any contractor. We highly recommend Mauricio Stonecraft. Thank you! We received great service and great quality on the stone we chose and the installation. Very responsive and on time. Will definitely recommend to friends and family. Chris and Myrna Savage.Chris and Myrna Savage. We just had our kitchen counter-tops replaced with granite and the tile back-splash redone. These guys were fast, responsive, cleaned as they went, and made sure we were happy with everything once it was done. We had the same guy quote us and come and check on things, and the same crew for the job. (unlike big corporate companies where they pass you off from one person to the next) We had the quote and installed only a few days later. The tile back-splash was done so well!!!! And we didn't pick an easy back-splash. We definitely recommend them!!!!! Abel and his Crew did a really good job on our kitchen tops, and really great pricing. Still getting great compliments from friends and family how great it all looks. Extremely reasonable prices. Mauricio was pleasant to deal with. Him and his crew do good work. Wouldn't hesitate using again. Unfortunately, I used him for my house I was selling prior to moving from DFW. They did an amazing job on my kitchen and bathrooms granite countertops highly recommend. Thanks again. I had my install yesterday. You guys did an amazing job. Everything was very timely and professional. I would recommend you to anyone. Great company to work with! Beautiful countertops and excellent customer service! Highly recommend!! use Abel again for our next project. come back to do my granite countertops. forward to seeing the finished project! After installation they made sure I was pleased and clean the area. I strongly recommend this company. great. I would high recommend them for any jobs in the future. cabinet to make sure the new countertops will look perfectly beautiful. pricing and service, Keller TX. and do our laundry room! We highly recommend Abel and his team!